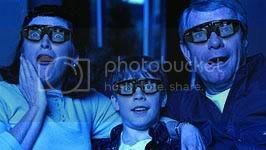 Home > 3D Glasses for 3D Projectors > 3D Theater For Any CRT Picture Tube Television > RETAIL PACKAGED! 14 DVD Virtual FX 3D Converter! IMAX! Get the PERFECT X-MAS GIFT for 3D fans! This is the Official US Release RETAIL PACKAGED Virtual FX 3D Boxed Set! You will not find this anywhere else! Includes 14 GUARANTEED DVD titles (listed below including 5 IMAX DVDs), high performance wireless glasses and the VFX 3D converter box. This unit makes the perfect gift simply because of the amazing retail packaging! This advanced unit can also add 3D depth to any 2D video signal... from DVDs, VCRs and even video games! That's hours of mind-blowing 3D fun! Packages includes connection cable, quick start card, power supply, and instructions. This fun collection will include exactly what is listed which includes the 14 Guaranteed Titles (5 of which are IMAX), Virtual FX 3D converter, two pair of high performance Elsa style glasses, remote control and everything else that is needed for the Ultimate 3D Experience! These Great 3D Titles Included!